Energy-saving, eco-friendly and convenient: this yoghurt maker is only operated with boiling water and does not need any electricity. Laborious temperature-measuring is not necessary. 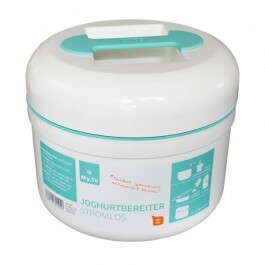 Another benefit: In the My.Yo yoghurt maker, you can keep meals warm or cold for up to 6 hours. Fresh yoghurt in 4 easy steps. For 1 litre of freshly made yoghurt. Temperature measurement no longer necessary. Mix 1 bag of My.Yo yogurtferment or 100-150ml of yoghurt while stirring with a liter of your favourite milk (room temperature) in the loose inner container. Securely close the inner container with the lid. Pour 3/4 liter of boiling water into the outer container. Place the inner container in the outer container, turn the lid on and ready! The yogurt is ready for use after 12-14 hours. The space-saving inner container can easily be placed in the refrigerator. The yogurt can be stored for up to 7 days. 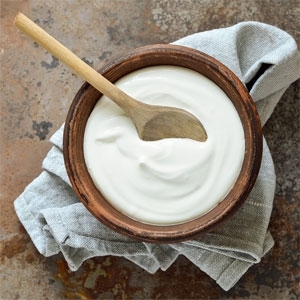 If you have your freshly prepared yoghurt in the inner container in the fridge, you can start again with an additional inner container with new yoghurt or kefir. Care: Rinse only with a damp cloth. Internal container is dishwasher safe. Energy-saving, eco-friendly and convenient: The My.Yo yoghurt maker uses only boiling water and does not need any electricity. Laborious temperature-measuring is not necessary. Another benefit: You can use the yoghurt maker to keep meals warm or cold for up to 6 hours. The My.Yo container is made from BPA-free plastic food safe (Polypropylene) so that no toxins end up in the kefir or yoghurt and is suitable for use in the dishwasher and microwave.